Directly digitize recordings of music cassette tapes, streaming Internet audio, vinyl LPs, videos, ect. Digiters Sound Recorder is a professional sound recorder software. With the recorder you can directly digitize recordings of music cassette tapes, streaming Internet audio, vinyl LPs, videos, and meetings directly to your computer’s hard disk, creating popular mp3 or wave sound files on the fly. Digiters Sound Recorder can record from any sound card input line, from microphone, line-in, cassettes, LPs, to CD, DVD, your home stereo or an MD player. What's more, it can record sound played by other programs (e.g. RealPlayer, Windows Media Player, Quick Time, WinAmp) including live Internet broadcasts. Digiters Sound Recorder enables you to record sound, played back through your sound card and any other sound sources like Line in, microphone, VCR, CD, DVD, Audio tape player, Telephone Data, etc. You can use it to grab any sound, including music, dialogs from movies, game sounds etc. From your local computer or the internet. You can convert any exotic audio file or rip CD! Just play this file/CD with Media Player and record it with MP3/WMA Recorder to MP3,OGG,WMA,APE or WAV format. With its professional sound engine, Digiters Sound Recorder produces CD quality recordings. 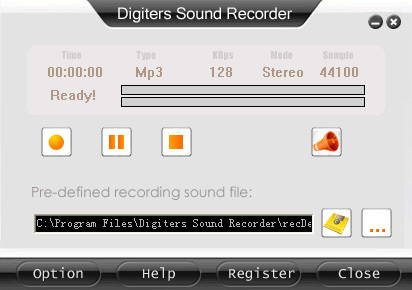 Digiters Sound Recorder can record any signal played through your sound card into Mp3 and Wav files. Digiters Sound Recorder can start and stop recording at any time you set. Digiters Sound Recorder integrates the complete set of record volume control for your convenience. Digiters Sound Recorder can automatically detect the recording formats your sound card supports and then set the application's parameters for the best possible performance. The default parameters work in most cases, but you can change them easily to best suit your needs. Digiters Sound Recorder can record on the fly for as long as your like without interrupt. It can record and save to an mp3 file in one operation instead of having to save it to a wav and then spend time converting.